Endoscopic mucosal resection is a new endotherapy technique that can avoid the need for open surgery in the treatment of many superficial gastrointestinal cancers. 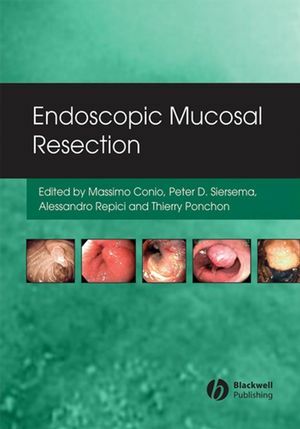 In this practical ‘how-to’ manual, experts in the field provide specific, technical guidance on all aspects of endoscopic mucosal resection relevant to therapeutic endoscopic practice. 1 Epidemiology of Gastrointestinal Cancer: (Trends in) Incidence and Mortality from Esophageal, Stomach, and Colorectal Cancer:. Valery E.P.P. Lemmens (Comprehensive Cancer Centre South, Eindhoven) and Jan-Willem W. Coebergh (Comprehensive Cancer Centre South, Eindhoven). 2 Etiological Factors in Gastrointestinal Tumors: Rosangela Filiberti (National Cancer Research Institute, Genoa) and Maria Antonietta Orengo (National Cancer Research Institute, Genoa). 3 Staging before EMR: Peter D. Siersema (University Medical Center Utrecht) and Paul Fockens (University of Amsterdam). 4 Advances in Endoscopic Imaging of Barrett’s Esophagus: Amitabh Chak (Case Western Reserve School of Medicine, Cleveland) and Farees T. Farooq (Case Western Reserve School of Medicine, Cleveland). 5 EMR Techniques: Liebwin Gossner (Teaching Hospital of the University of Freiburg) and Christian Ell (Teaching Hospital of the University of Mainz). 6 Endoscopic Mucosal Resection in the Esophagus: Massimo Conio (General Hospital, Sanremo). 7 Stomach: Naomi Kakushima (The University of Tokyo Graduate School of Medicine), Mitsuhiro Fujishiro (The University of Tokyo Graduate School of Medicine), and Takuji Gotoda (National Cancer Center Hospital, Tokyo). 8 Endoscopic Resection of Ampullary Neoplasms: Guido Costamagna (Università Cattolica del Sacro Cuore, Roma) and Christopher Gostout (Mayo Clinic Division of Gastroenterology and Hepatology). 9 EMR for Colorectal Lesions: Alessandro Repici (IRCCS Istituto Clinico Humanitas, Milano), Giuseppe De Caro (IRCCS Istituto Clinico Humanitas, Milano), Carmelo Luigiano (IRCCS Istituto Clinico Humanitas, Milano), and Riccardo Rosati (IRCCS Istituto Clinico Humanitas, Milano). 10 Histopathology of Endoscopic Resection in the Gastrointestinal Tract: Michael Vieth (Institute of Pathology, Klinikum Bayreuth), Ralf Kiesslich (University of Mainz), and Kaiyo Takubo (Tokyo Metropolitan Hospital). 11 Follow-up after Endoscopic Mucosal Resection: Mihai Ciocirlan (Hôpital Edouard Herriot, Lyon) and Thierry Ponchon (Hôpital Edouard Herriot, Lyon). 12 Endoscopic Submucosal Dissection: Helmut Messmann (Clinic of Augsburg). 13 EMR and ESD for early Gastrointestinal Cancers: Sergio Coda (University of Rome “La Sapienza”, Rome), Ichiro Oda (National Cancer Center Hospital, Tokyo), Takuji Gotoda (National Cancer Center Hospital, Tokyo), and Yutaka Saito (National Cancer Center Hospital, Tokyo). 14 How to Cope with Complications Throughout the Gastrointestinal Tract: Ichiro Oda (National Cancer Center Hospital, Tokyo), Hisatomo Ikehara (Jikei University School of Medicine, Tokyo), Chizu Yokoi (National Cancer Center Hospital, Tokyo),. Takahisa Matsuda (National Cancer Center Hospital, Tokyo), and Pradeep Bhandari (Portsmouth Hospital NHS Trust). 15 Prototypes and Future Directions of Endoscopic Research: Paul Swain (Imperial College, St Mary’s Hospital, London) and Keiichi Ikeda (Jikei University School of Medicine, Tokyo).